Are you looking for a good tourist spot in Bangka Island? There is Penyusuk Beach. It is the pride of Belinyu District. The location is near to Bukit Ketok Village. 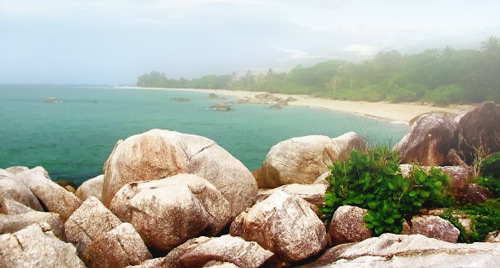 It is a stunning coastal area, but it is not as popular as other beaches in Bangka. Fortunately, Laskar Pelangi Movie has made it famous. More travelers come to this area over time. These include foreigners. No one got bored visiting Penyusuk. The beach also attracts swimmers and nature lovers. Thanks to its nature beauty. Once you reach Penyusuk Beach, you can feel its secluded atmosphere. No keepers and food vendors around. Even though it looks like a desolated beach, it has an amazing nuance. The most interesting part is the waves. The beach faces the North Sea. That means it features strong waves. Even local fishermen’s boats aren’t able to reach the shorelines. Despite this condition, you can find calmer waves in the west part of Penyusuk Beach. Here, tourists are allowed to swim and play water. Still, you must pay attention to your kids. As mentioned before, the main attraction in Penyusuk Beach is the granites. They combine well with the green and shady trees. All of them make a stunning coastal view. Next, it is the shoreline. Penyusuk is located in the west part of the island. That means it has calmer waves than others. Due to this reason, you are able to enjoy water sports safely. Some parts of the shorelines have stronger waves, though. You can take advantage of it for surfing! Penyusuk Beach features small islands. The most famous one is Lampu Island. Also, it is possible to reach those islands. You only need to rent a local boat. What about the fee? Well, it depends on the situation. For cheaper prices, you need to learn how to bargain. A boat accommodates up to 11 people. During the trip to those tiny islands, you may see cute fishes in the sea. In Lampu Island, you can find a lighthouse. The views are jaw-dropping from above. In the right part of Penyusuk Beach, you can see the stunning North Sea. It is a wonderful spot for sightseeing. For a romantic experience, you should come with your spouse. Next adventure is in Bukit Ketok Village. You can enjoy numerous local dishes there. It is because the village features local eateries and food vendors. Also, there are many snacks like Bong Li Pang, Kericu, Getas, Sambelingkung, and Lempok. You should try them all! That means you must carry much money. From Pangkal Pinang, the trip takes 2 hours and several minutes to Belinyu District. Actually, your main destination is Bukit Ketok Village. Even though it is considered a moderate trip, you can enjoy stunning views along the way. Thus, it won’t be boring at all. Once you reach Penyusuk Beach, you can see the calm blue sea and solemn white sand. What a great view! Don’t forget to visit Lampu Island, as well.